Heather Gooze says she stayed by Canadian Jordan McIldoon's side for more than five hours after he succumbed to his gunshot wounds on Sunday night. Heather Gooze says she stayed by Canadian Jordan McIldoon's side for more than five hours after he succumbed to his gunshot wounds on Sunday night, even though she'd never met the man. "I couldn't just leave him by himself," Gooze told As It Happens host Carol Off. "I don't know, I just couldn't leave him." Gooze said she was bartending at the Route 91 Harvest country music festival in Las Vegas on Sunday night when shots started to ring out. "I had a British gentlemen's credit card in my hand and was like swiping it through the machine to charge for his Budweiser when all of a sudden there was thousands of people pushing their way into the bar and screaming and saying, 'Shooter!'" she said. "It sounded like thousands of fireworks going off." She was about to run herself, she said, but "something inside of me made me stop." That's when hoards of injured people began pouring into the bar, many of them carried on makeshift stretchers by other festivalgoers, she said. "People were holding people," she said. "This guy was dragging a guy by the fingers through the bar because he had gotten shot." She'd just finished helping to load one man with a head wound into the back of an ambulance when a group of men came in with a bleeding young man stretched out on a piece of security fence, she said. They dropped him off with Gooze and went back out into the streets in search of more victims. 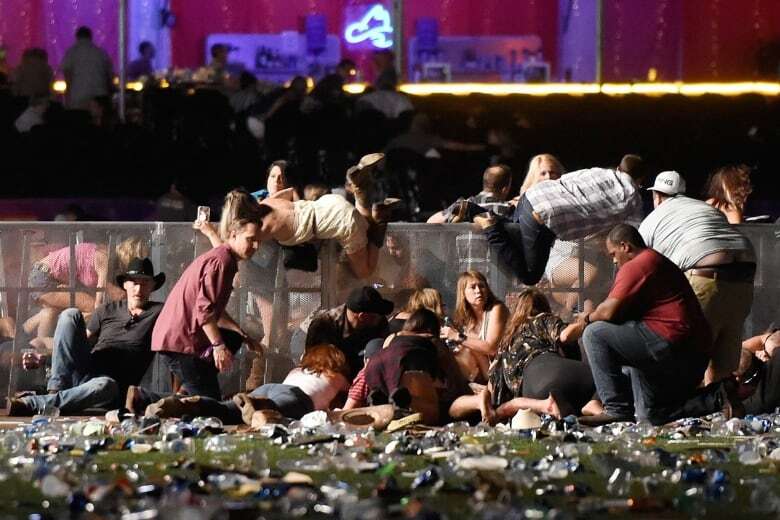 People scrambled for shelter at the Route 91 Harvest country music festival after gunfire broke out. Gooze held the man's hand. "I felt his fingers, like, tighten and then loosen," she said. She checked his vitals. She said he was already dead. It was his friend. She learned the dead man's name was Jordan McIldoon, and that he was a 23-year-old man from Maple Ridge, B.C. She said she wrote his name on his arm, and she looked him up on Facebook and started messaging his family. His phone rang again. This time it was McIldoon's mother. She learned that he had attended the festival with his girlfriend Amber Bereza. Gooze said she took down Bereza's number and called her. She was alive, unharmed, and in lockdown in the basement of the Tropicana hotel. "I said I was with Jordan and she said, 'Is he hurt?' and I said, 'Yes.' And she said, 'Is he OK?' and I said, 'No.' And she said, 'Please be honest with me, what's going on?' And I said, 'I didn't want to be the one to tell you this but he didn't make it,'" Gooze said. "And she said, 'No, that's not true, he's got to be breathing. Check again to see if he's breathing.' I said, 'I've been with him over and hour now … he didn't make it.' And she said, 'He's the love of my life. Please tell me that he's OK.'"
McIldoon was one of four Canadians confirmed to have died in Sunday night's massacre, when a gunman unleashed a hail of bullets from the 32nd floor of a Las Vegas hotel-casino on the outdoor festival below, killing at least 59 people and injuring more than 500. "At that point I promised her that I would absolutely not leave his side, that I would be her contact, that I would make sure she knew where he was going to be moved to, what was going on," Gooze said. Then she said McIldoon's mom called back. She seemed calm at first. "Then she told me his childhood nickname is Blimpy because he was a blimp when he was little, that he's covered in tattoos, that he loves life and he loves his girlfriend," she said. Gooze said she then made the same promise to McIldoon's mother that she'd made to Amber — that she would remain by his side. "I would never want myself or one of my family members to be left alone," she said. "I needed to make sure that they could identify him, that they knew who he was, that they knew he has a girlfriend who was here." Still, she insists she's "not a hero." "People were running into the ... line of fire and finding bodies and finding people and trying to save their life. I just happened to be in the place where I was able to help." According to screenshots cirulating on Facebook, Bereza has suggested that McIldoon died while they were together. As It Happens is not able to confirm McIldoon's exact time of death. Bereza did not immediately respond to a request for comment. McIldoon's family issued a statement to CBC News, which reads: "From the people who stayed with Jordan that night and held his hand, to the first responders who had to rush in to an unimaginable scene, we would like to thank everyone for their incredible love and support. Jordan did his best to make sure Amber was safe and we know he would have helped others had he not been injured himself." 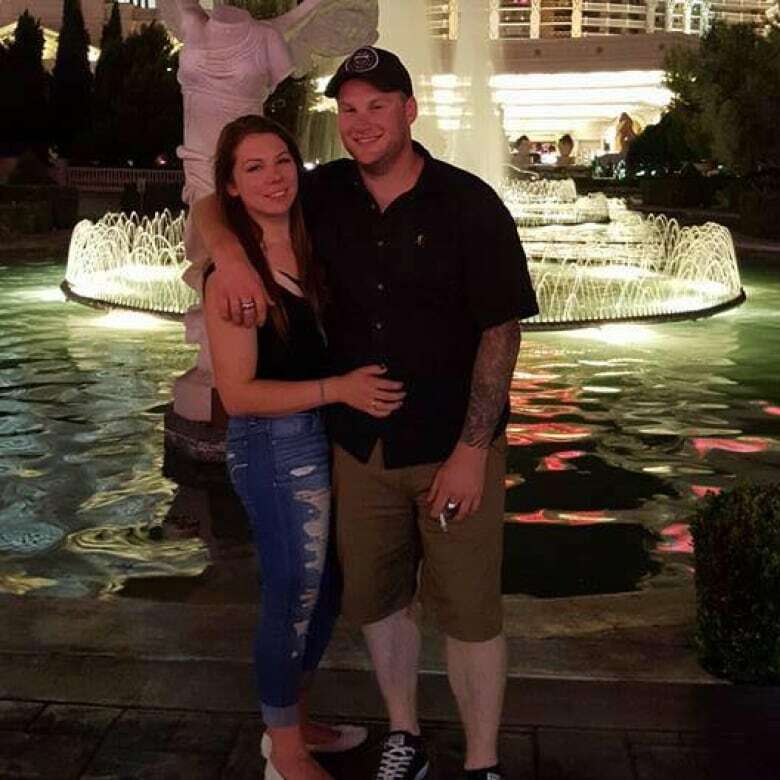 In an email, the family added: "Both Heather and Amber were there with him at points in the night and it really does not matter who was there at what time. It was bedlam and chaotic. Let's focus on what we do know, he was killed there and now we are working on getting our boy home." Clarification: An earlier version of this story stated that Heather Gooze held Jordan McIldoon's hand while he died. As It Happens, however, is unable to confirm McIldoon's exact time of death.